If you need a lively birthday card, you're in the right place! Cut a 10”x7” piece of cardstock from desired print in the stack. Lay the paper horizontally on the workspace, print side up. Make a score line from top to bottom, 4-3/4” in from the right. Flip the paper over (ensuring that the score line that was just made is still on the right) and make a score line 2-5/8” in from the left side, top to bottom as well. Flip the paper back over (print side up). Beginning 1/2” down from the top, and using the ruler to keep the circles evenly spaced, trace and cut (3) 1-3/4” half circles (the cuts need to go to the left of the left score line. In other words, the first panel on the left is the one that will end up with holes in it). Select another print from the stack (we used the ice cream print) and cut out (2) 2-1/8”x6-3/4” and (1) 4-1/4”x6-3/4” pieces. Adhere the largest piece to the center of the last (right) panel (in between the right edge and the right score line). Adhere one of the other pieces to the center panel (centered between the top and bottom and the 2 score lines). Cut 3 half circles from the last strip, right side, ensuring they match up with the placement of the half circles in step 2. Adhere this to the center of the last panel (left side). Cut a 3-3/4”x6-1/4” and 1-7/8”x6-1/4” set of cardstock pieces from the white cardstock. Adhere the largest piece in the center of the largest panel. Adhere the 2nd piece in the center of the middle panel. Punch (3) 1-3/4” circles from another print in the stack. Punch (3) 1-1/2” circles from an additional print in the stack. Adhere the smaller circles (1 each) to the center of the larger circles. Fold the card along each score line to create a trifold card. Take the circles from step 6 and adhere them in place (adhere the left half of each circle, one in each space, to the back of the card showing through the holes made in step 3). 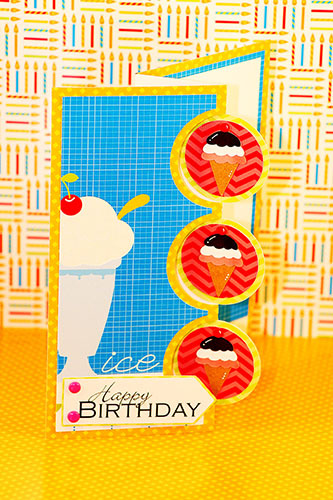 Embellish with a “Happy Birthday” saying, enamel dots, ice cream stickers, and more. Write a message on the inside and deliver to the lucky recipient! Don’t have circle punches? Try using a circle cutter or items around your home to create the different sizes you’ll need for this project. Want an easy way to have matching embellishments for your project? Cut them from the stack, mount them onto pieces of chipboard or extra paper (or leave as is) and then adhere them in place!